One of the neatest things about wine is that it isn’t merely a beverage; it’s history and culture in liquid form. In this segment, we’ll feature a singular wine from one of the world’s nearly two hundred nations. Red, white, fortified, sparkling – whatever mood we’re in (or whatever is available) is what we’ll have to share. Saving our home in the US for last, we’ll strive to be both daring and unique, and to provide a little education about the nation of origin, its history, and its wine as well. If you’re afraid to venture beyond the Russian River Valley, this probably isn’t for you. But if you’re adventuresome and the curious type, well then, we welcome you along on the journey! For our first entry in this eighty-part series, we’ll start in someplace unexpected, in the heart of Africa’s Great Lakes region. A place well-known, but not for wine: Rwanda. 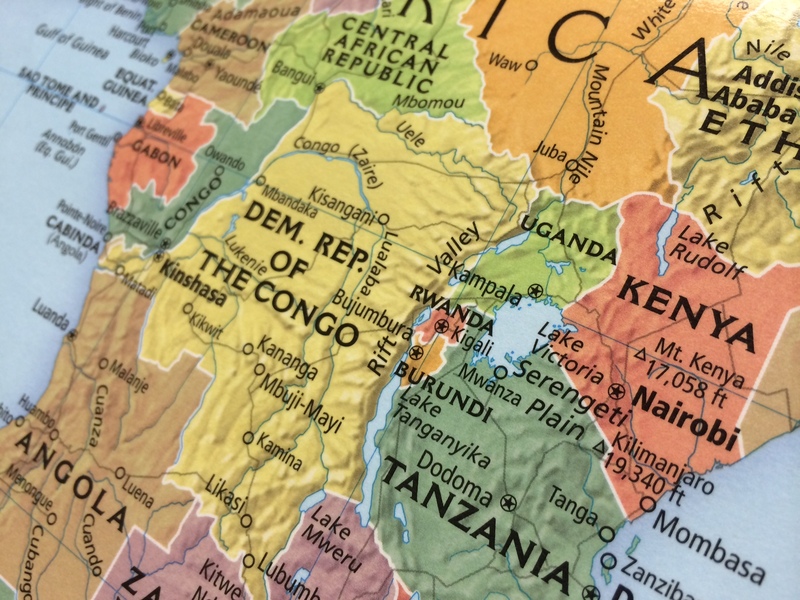 Pictured: Rwanda is located in the center of the map, with Uganda to the north, Burundi to the south, Democratic Republic of the Congo (formerly Zaire) to the west, and Tanzania to the east. Affectionately nicknamed the Mille Collines, or “Land of a Thousand Hills,” Rwanda is known for it’s gorgeous rolling hillsides, the famous mountain gorillas, and, of course, the genocide of 1994. Twenty years ago this April, over the course of 100 days, extremist Hutu militias in league with government forces and civilians slaughtered nearly a million people, all of them Tutsi or moderate Hutus. This rift was created when Belgians, who had taken over the area from the Germans as part of the provisions of the Treaty of Versailles, divided the banyarwanda, the people of Rwanda, into groups to create a minority ruling class, the Tutsi. In 1959, Hutu extremists rose up, driving hundreds of thousands of Tutsi out of Rwanda. From 1959 to 1994, conditions for Tutsi remaining in Rwanda were discriminatory, often violent, and in 1994, the infamous genocide claimed the lives of a million human beings. 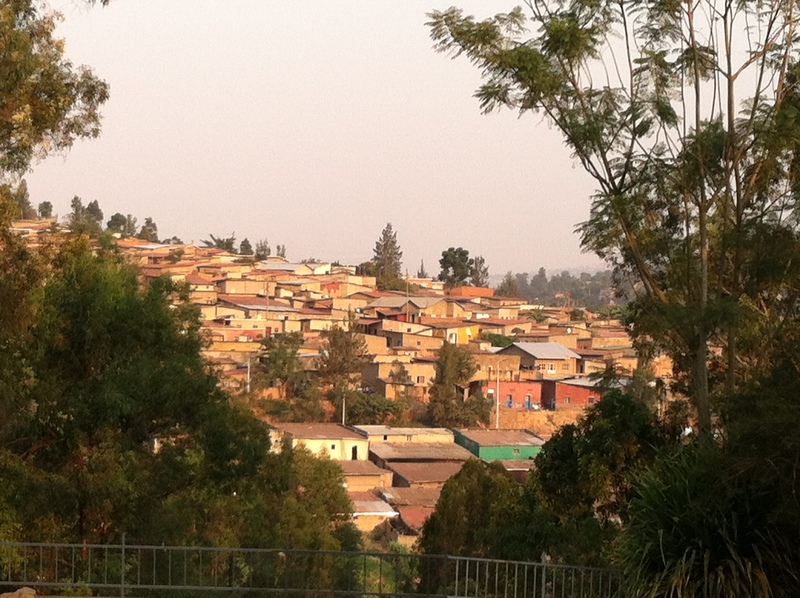 Pictured: One of the rolling, populated hillsides of Kigali. But Rwanda shouldn’t be known only for the worst one hundred days in history. It is also a place of unparalleled landscapes, exotic animals, innovative industry, beautiful people, and vibrant culture. That culture is made up of dance and drumming, basket weaving and artwork, history and tradition and, like all cultures, cuisine. In Rwanda, one will find wonderful goat and fish brochettes, dozens of tasty ways to prepare a banana, and countless other dishes unique to the tiny African state. As for drink, Rwanda is much more famous for urwagwa, the “banana beer” that many of locals brew, than it is for traditional wine. In fact, I have been traveling back and forth from Rwanda since 2008, but it wasn’t until 2013 that I noticed Rwanda making its own grape wines for consumption and, perhaps one day, export. 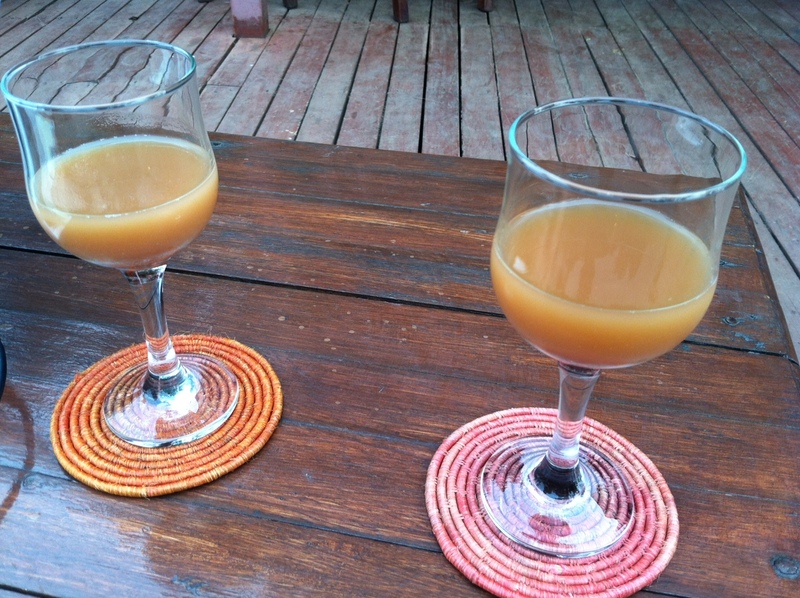 Pictured: Two glasses of urwagwa, Rwanda’s strong and tart banana beer. The wine I brought back for Sonja and I to try was Akarusho Red 2011, a dry red wine which also comes in sweet red and white varietals. On a recent trip to Rwanda to put on an educational conference about the Holocaust and the 1994 Genocide Against the Tutsi, I noticed the bottle in a local store, got curious, and brought it back to share with Sonja. A product of parent company Urwibutso, the wine’s colorful label professes “Wine of falvour to raise appetite. Just have a taste!” So we did. And we were quite impressed! With a low alcohol content (around 7%) the wine was well balanced, and possessed many of the distinct characteristics of wine that “experiments” often lack. It had a fair level of acidity, and also tannins, and a delightful fruitiness that was not “grapey” just good. And at 7,000 Rwandan Francs per bottle (a little more than $10), well, it seems likely that Rwandan’s affinity for urwagwa and Fanta may soon be complimented by their wine palates as well. 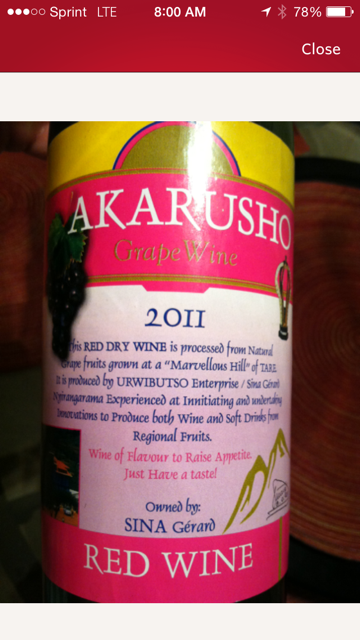 Pictured: The front label (in a Vivino scan) of Rwanda’s Akarusho Red, 2011, marking the nation’s newest endeavor into the wine making business. In the aftermath of the genocide of 1994, Rwanda has been transformed into one of the most successful and advanced nations in Africa. Trade has boomed, and the economy has grown steadily, bringing in hundreds of millions of dollars annually from tourists who wish to see the famous mountain gorillas, go on safari in Akagera National Park, or visit Lake Kivu, one of the largest and most scenic lakes on the continent. Rwanda is a progressive nation; plastic bags have been banned in favor of paper or canvas, and the democratically elected parliament boasts a membership that is 64% female – the only nation in the world that can make such a claim. As part of Vision2020, the government’s official plan and pathway to the future, skyscrapers are being erected throughout the capital city of Kigali, promoting business and encouraging international investment. Rwandans themselves have moved forward admirably since their time of greatest crisis, and while many genocidaires remain incarcerated, much of the displaced Tutsi diaspora have been repatriated. Further, the terms “Hutu” and “Tutsi” have been stricken from their vocabulary, in favor of simply “Rwandan.” In the aftermath of one of the greatest tragedies ever to occur, the beautiful nation and her people move steadily forward, toward a brighter future. 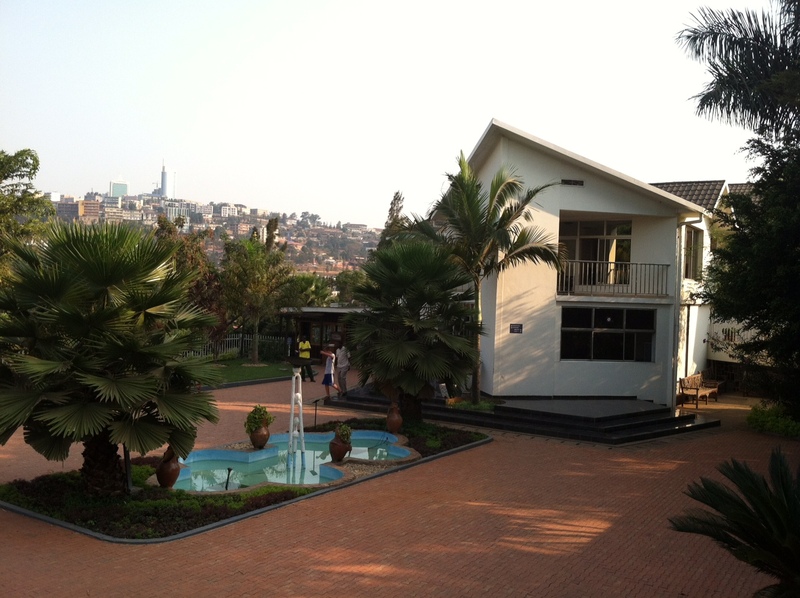 Pictured: The Kigali Genocide Memorial, located centrally in the nation’s capital. The memorial hosts conferences, contains an excellent exhibit, and is surrounded by lush gardens. It is also the final resting place for an estimated 250,000 Rwandans, victims of the 1994 Genocide Against the Tutsi. In the background, Kigali booms; visible in the skyline is Kigali City Tower, one of the most modern and impressive structures on the entire continent. With all of this growth and advancement taking place, it may be reasonable to think, given the quality of the product, that wine may play some part in the booming economy of the Mille Collines. For my part, I travel there to work with teachers, not as a tourist but as the director of a non-profit organization. In candor, I can say honestly that I have fallen in love with this amazing country. And when I’m there, I always enjoy the local cuisine, and I will enjoy it even more now that I can have, alongside my baked banana and goat brochette, a bottle of excellent, locally-sourced wine. Kavitha, thank you so much for your kind words! We’re really looking forward to writing this series and hope that you enjoy it. Any recommendations about other far away nations and their interesting wines? We’d love your thoughts. Thanks for reading! Have a fantastic day! Kavitha, we regret never having been to India! (Sonja’s closest is China, while mine is Israel.) However, I am pleased to report that Sonja makes great Indian food, and we enjoy the local Indian places to eat, too. We’ll look for Indian wine and make it a feature at some point in this series, we promise! Thanks for reading. Have a great night! Sounds like a plan! Good luck with the series to you Mark and Sonja! This is a great series idea, Mark. Thanks for such a lovely brief rundown on the people, history, and culture of Rwanda. Our wine club selections last month included a blend of Syrah, Cab Franc, and Cab Sav from Lebanon. We’re pretty curious, but it came highly recommended from our wine guy, so we shall see! Thanks so much, Chad! We’re excited to write the next one. Let us know when you’ve tried that Lebanese wine, for sure! We’ll look forward to hearing from you. Cheers!